Henry Bradshaw-Isherwood inherited Marple Hall at the age of fifty-six following the death of his father, John, in 1924. Henry tried living at the Hall for a short while but soon returned to London, placing it in the hands of caretakers. Discover how this sale resulted in the naming of Agatha Christie's Miss Marple! 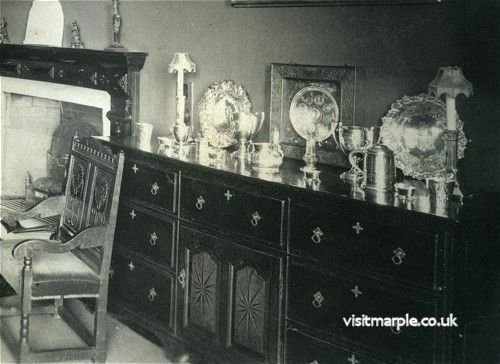 Silverware in the Dining Room at Marple Hall in 1902 that was auctioned in 1929. 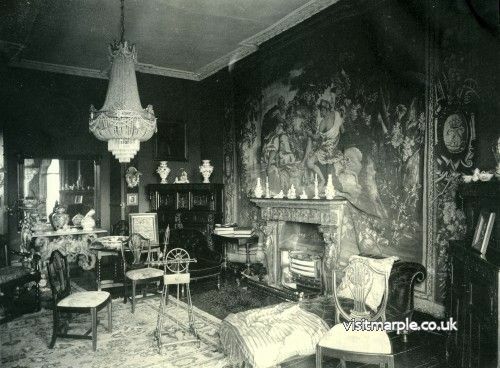 The preliminary announcement of the forthcoming sale of antique furniture, armour, china, pictures and tapestries in Marple Hall, the spacious mansion of Mr. Henry Bradshaw-Isherwood, has created much interest in Marple and district for the old hall is one of the few historic residences of which natives to the village are justly proud." As the reporter made his way from room to room, he went on to describe the contents of the hall that were to fall under the hammer. 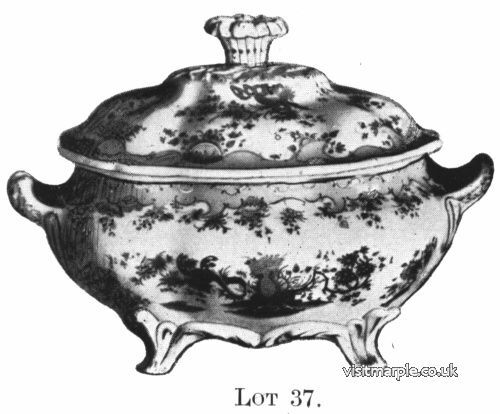 A thirty-one page illustrated catalogue detailing all 378 lots was also produced and sold for 2 shillings each. 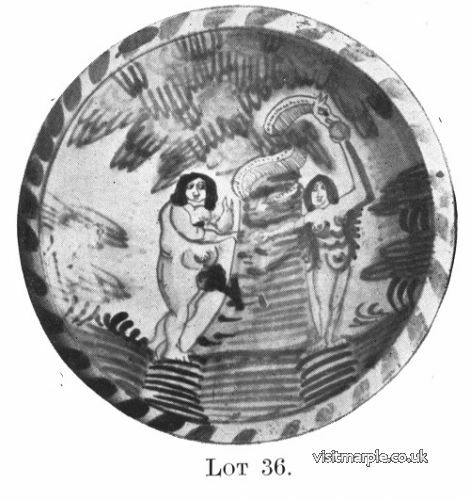 The catalogue entitled two persons entry to the hall to view the lots in advance of the sale. I'm fortunate to have been loaned an original copy of the catalogue by Martin Davies of Marple, this includes many prices pencilled in the margins by the person who attended the sale, making it a most interesting document. Copies of the catalogue have been placed in Marple Library. The whole of the articles belong to the Bradshaw-Isherwood family, and so far as can be traced most of the antiques have been at the hall for several generations. At the death of the late Mr. John Henry Bradshaw-Isherwood, the majority of the articles offered for sale were examined by Government experts, and exempted from estate duty, until sold, on the grounds that they constituted a collection of national importance." By combining information from the catalogue and newspaper articles, the following report gives a feel for the highlights of the sale. For added interest and to put things into perspective, prices have been converted to today's values (2017) and shown in brackets. It's almost certain however, that most of the items are now worth many times these values and in some instances, possibly even priceless. Collectors and antique dealers from all parts of the country and from the Continent gathered at Marple Hall, as the first lots were offered. There was spirited bidding for the china and porcelain as a 17th century English Delft blue dash charger decorated with Adam and Eve achieved 14½ guineas (£911). A magnificent 116 piece Chamberlain's Worcester dinner service, decorated with exotic birds and flowering shrubs in brilliant enamels, realised 32 guineas (£2,011) and a sum of 51 guineas (£3,205) purchased an exquisite hanging drop shaped cut-glass chandelier. There was keen competition for the arms and armour, full suits fetching from 15 guineas (£943) to 56 guineas (£3,519). A lot including two pikes with fine heads and poles covered in velvet, similar to those in the Tower of London Armoury and dated 1480, were purchased for 40 guineas (£2,514). Another lot including a two-handed sword, probably of the reign of Henry VII, and also like one at the Tower of London, was sold at 14 guineas (£880). 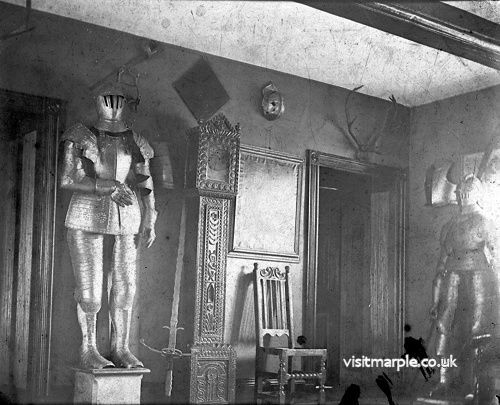 Armour and weapons in the entrance hall to Marple Hall. Mr. Brady, the auctioneer, advised that the family portraits and pictures listed in the catalogue had been withdrawn from the sale. (There were approximately a dozen of these – where are they now, I wonder?) A painting of Thomas Coventry, Lord Privy Seal during the reign of James I, fetched 43 guineas (£2,702) and one of Queen Elizabeth I of England, in magnificent attire and richly bedecked in jewels, was sold for 45 guineas (£2,828). A sum of 45 guineas was also paid for a portrait of the Earl of Essex, and 40 guineas (£2,514) for one of Sir John Crowe, President of the Royal College of Surgeons. A three-division stump needlework picture was purchased for 41 guineas (£2,577), whilst a lot described as "sundry reproductions of famous pictures, etc." was sold for just 5 shillings (£15). Hundreds of books were sold in combined lots. Eight volumes of the works of Ed. Burke, and twelve of Johnson, both 1801, fetched £5 15s (£344). Another lot consisting of Ormerod's "History of Cheshire", Earwaker's "East Cheshire Past and Present", and eight volumes of Rushworth's "Historical Collections" in tooled leather and printed in 1722, achieved £12 (£718). The attendance on the second day included dealers from all parts of the country and principal interest centred on the sale of the tapestries. These attracted a would-be buyer from Spain, but they all eventually went to a London dealer. A large early 18th century Gobelins tapestry, representing Winter, fetched 600 guineas (£37,706). A companion tapestry, representing Autumn, achieved the same price despite having been cut to fit around the dining room fire place! At least the severed portion was included in the lot. These two tapestries were part of a set of four depicting the seasons, the other two at that time were known to be in the Royal Palace of Fontainebleau. Since writing this article I discovered that these two tapesties were purchased by William Randolph Hearst and now reside in the Art Instutute of Chicago. Thanks to the At Institute you can now see the tapestries in full colour. Another tapestry, this time late 17th century Flemish and representing Summer, probably also from a set of four, went for 400 guineas (£25,137). Two further Flemish tapestries of the same period, representing Harvest and villagers in rural occupations were sold for 160 guineas (£10,055) and 170 guineas (£10,683). 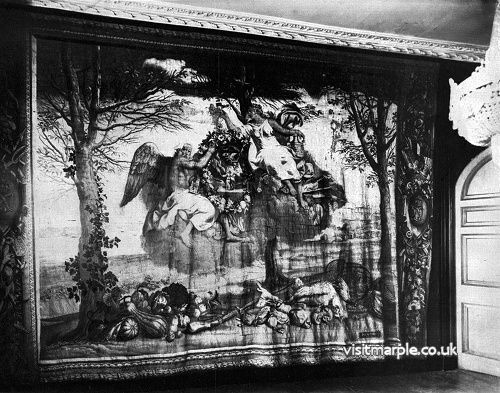 The catalogue describes all these tapestries as being brilliant in colour, the black and white photographs here only hint at how magnificent they must have been. 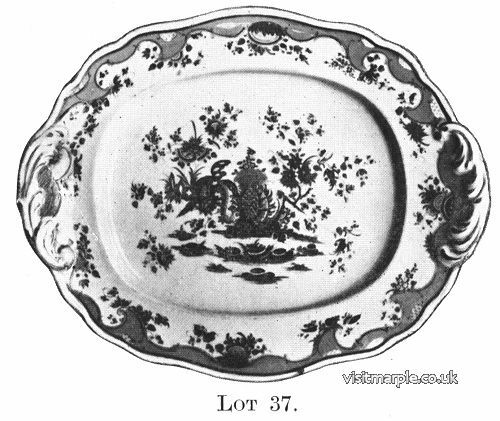 A remarkable feature of the sale was the high price paid for the silverware, some of which can be seen in the photo at the top of the page. A record of 325 shillings per ounce was achieved when a set of six plain trencher salts, dated 1720 and weighing 25½ ounces, were bought by Mr. Van Engal, a Liverpool dealer, for £414 7s 6d (£24,868). 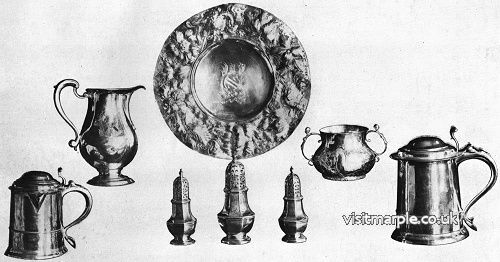 The six lots illustrated in the photograph of silverware were sold for a combined price of £737 14s (£44,170), the most expensive being the 14" diameter hammered and chased tazza at £316 17s 6d (£18,973). Oak cupboards, chests, tables and chairs too numerous to mention all achieved high prices. 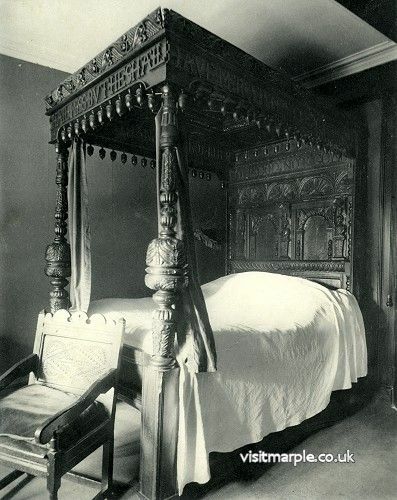 One of the most interesting lots was the antique oak canopy bedstead covered in mottoes and said to have belonged to the notorious Judge Bradshawe, who signed the death warrant of Charles I. This realised 52 guineas (£3,268). The sale added considerably to Henry's wealth. I have records of the prices for only 40% of the items sold, amounting to £6,920 (£414,169). When he died in 1940 he was declared to be worth £75,858 19s 9d, or a staggering £4.54M in today's terms. The tragedy is that the real cost of the sale was the breaking up and scattering to all corners of the world this "collection of national importance." Today none of the items sold remain in Marple, unless of course, you know different! Thanks to Martin Davies for the loan of his original catalogue. To Marple Local History Society for providing copies of the missing pages. Also Glossop Heritage Centre for their newspaper archive. This page appeared as an article by Mark Whittaker in the May 2001 issue of the Community News, in our regular feature "Local History & Heritage with the Marple Website". So what's the link to Agatha Christie's Miss Marple? There has long been speculation that the name of Agatha Christie's most famous character, Jane Marple, was somehow linked to the name of our town. These stories linking Agatha to places she might have stayed always had the ring of wishful thinking until, in July 2015, Mathew Prichard, grandson of the author and her closest living relative came to Marple and talked at Marple Station about his family’s linkage to the area. He unveiled a blue plaque at the station that the Agatha Christie Ltd had kindly commissioned. This was done against the backdrop of artwork in the form of numerous Miss Marple book covers that had been specially produced by HarperCollins Publishers and now form a permanent addition at the station. He read aloud a letter that had returned into the Agatha Christie Ltd archives from a fan asking where the surname of Miss Marple had originated. Dear Mrs McMurphy, I expect you will be interested to learn that at the time I was writing The Thirteen Problems (starting with a series of 6 short stories for a magazine) I was staying with a sister of mine in Cheshire and we went to a sale at Marple Hall - the house alone, she said, was worth seeing, a beautiful old manor, belonging to the Bradshaws descended from Judge Bradshaw who sentenced Charles I. It was a very good sale with fine old Elizabethan and Jacobean furniture and at it I bought 2 Jacobean oak chairs which I still have - Wanting a name for my "old maid" character I called her Jane Marple. So now you know the answer to your question! For more information visit the web site of Friends of Marple Station.